Our collaborative ground-breaking report with the Housing & Finance Institute to set out the Four Pillars that underpin a Good Home was released yesterday. Mick Sweeney, Chief Executive of Radian, responds. Not that you would think it – based on current media airtime – but for most people, housing remains the greatest issue facing our country. And yet, despite their concern, the government fails to fully recognise the situation is getting worse, not better. 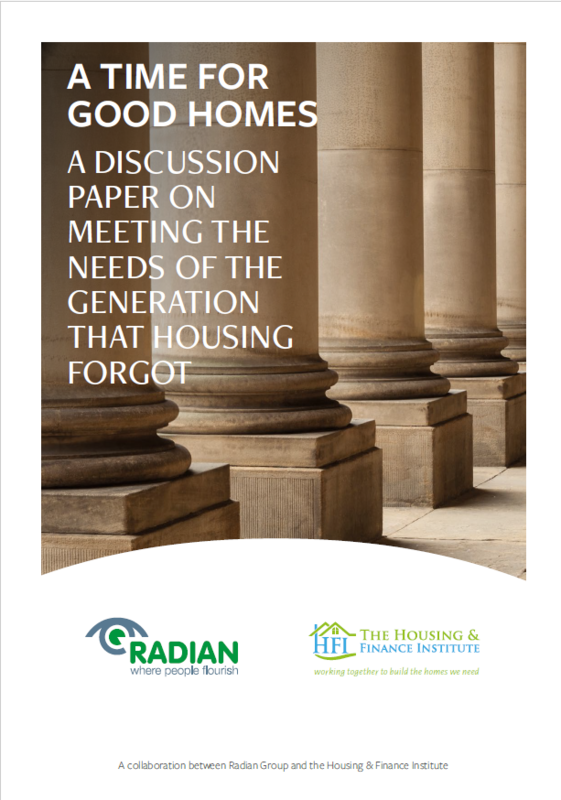 Our new report – A Time for Good Homes – delivered in partnership with the Housing & Finance Institute, has fully laid bare the problem, and identifies solutions. All too often, as housing providers, we will hear people say: ‘I need a decent roof over my head’ or ‘I just want a good home for my family’. Surely this ambition – to aspire to live in a Good Home – cannot be beyond our ability to deliver? So what is a ‘Good Home’? For us, it means a place that provides security and opportunity; a place where people can flourish and a place that is genuinely affordable. For many decades, around 90% of the UK’s housing market was comprised of a stable mix of owner-occupied and social rented homes. This housing economy had long been effective in balancing job mobility and stability. However, in 2002 this began to change, with a significant increase in the number of private rented sector homes and a decline in both home ownership and social rented properties. Although some of these private rented homes meet housing need, they are not providing the stable housing environment that is essential to a Good Home. The average stay in private rented housing is less than four years – approximately three times lower than that of social renters and four and a half times lower than that of owner occupiers. What this has meant is that now there are 2.4 million fewer households with access to a Good Home than 15 years ago. We’re calling this the Good Homes Gap and it affects around six million people. To provide enhanced housing stability for the nation, an additional 2.4 million homes are required in stable housing tenures today. This is a huge challenge. Real commitment and policy creativity will be required to ensure that both home ownership and social housing opportunities are available to a much greater proportion of the population. That will not be achieved simply by building more and more homes, regardless of tenure. Owner-occupation and social renting provide flexibility, affordability, opportunity and stability – the four pillars of a Good Home. A key recommendation in our report is that a housing stability target should be introduced: 90% of homes should be in stable tenures by no later than 2035. Given the decline in the overall numbers of social housing, a minimum level (floor) for the amount of social housing stock should be set. Access to a Good Home, and the innumerable positive effects it can have on an individual or a family, is more important than ever. At the moment the younger generations under the age of 44 face a triple hurdle: diminishing access to social housing, costly access to home ownership and the highest rents ever as a proportion of take home pay. We also recommend that the Government establishes an independent, national housing delivery commission tasked to produce a ten-year housing delivery plan based around the four pillars of a Good Home. But this report is by no means an attack on the private rented sector. Rather, it’s a radical re-think that seeks to place our ambition to live in a Good Home at the centre of policy making.